*SOLVED* What is jucheck.exe and should I allow it? You have probably got a pop up box saying that jucheck.exe is trying to connect to the internet. This file checks for Java updates and is perfectly safe (jucheck = JavaUpdateCheck – get it?). 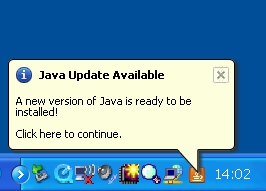 Because of vulnerabilities in older versions of Java, you should install the updates whenever prompted. It will be a pretty seamless installation. When asked if you wish to install the Yahoo toolbar I would suggest you untick the box, it’s yet another toolbar that adds into your Internet Explorer or Firefox browser. Beginners, Most read, Windows problems and errors. permalink.